Engage young audiences with Fire Prevention Week™ Kids' Activity Posters! Make it fun for kids to learn essential safety messages by providing them with Fire Prevention Week Kids' Activity Posters. These full-color posters include activities such as hidden pictures, puzzles, and word games that deliver clear lessons young children can absorb and remember. 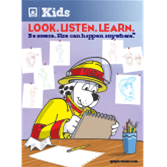 FPW™ Kids' Activity Posters feature Sparky the Fire Dog®, the loveable character who's been teaching kids and families how to stay safe from fire for generations. This year, he's inspired by his new friend and fellow safety advocate, Simon, who's helping to spread the word about the 2018 Fire Prevention Week theme: "Look. Listen. Learn. Be aware. Fire can happen anywhere"™. FPW Kid's Activity Posters are valued for making children aware of safety best practices during Fire Prevention Week and all year long. When they look up to see Sparky on their wall, they are reminded of the things they can do to reduce the likelihood of fires and stay safe in the case of an emergency.